Stay road aware with a built-in dash camera and driver alerts. Plan ahead thanks to traffic, parking and weather updates. Make the most of map updates to stay in the know. 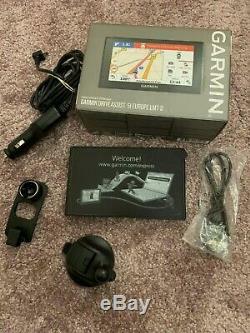 DriveAssist 51LMT-S EU 5 Sat Nav. Has everything you need to drive safely and be more aware of your surroundings. An Incident Detection G-sensor automatically saves video footage on impact, and records exactly when an incident has taken place. Real-time live traffic updates, parking, and weather information helps you to plan ahead and beat congestion, or awful driving conditions. The mapping information is constantly updated, so you're always in the know should emergency roadworks take place on your regular route. You also get driver alerts for upcoming sharp curves, speed changes, speed camera alerts and lane assist to guide you on your journey. And with voice activated navigation, you won't ever have to take your hands off the wheel. Make the most of map updates. Lifetime map updates for the UK, Ireland and Europe can be updated quickly and easily over a WiFi network. Just plug in your device at home and have it ready with all the latest information when you hit the road again. What are free Lifetime Maps? Sat nav devices or smartphone apps with free Lifetime Maps allow you to download full updates of your map every year - stay up-to-date with changes to road networks, addresses and points of interest, as well as new businesses, road changes and junction alterations. Updates are released at least four times a year and apply to the map that's pre-installed on your sat nav or included with your smartphone app. Geographical coverage and features will still match the original. Updates are free of charge and provided for the useful life of the device i. What is free Lifetime Traffic? Lifetime Traffic is a premium real-time traffic information service that shows exactly where delays start and end so you always know the fastest route. Lifetime Traffic is included with this premium sat nav device and cannot be transferred to another sat nav device or smartphone app. Full HD 1920 x 1080p. G sensor / accident detection. Lane departure warning - Front collision warning - Real vision - Go alert. Albania , Andorra, Austria, Belarus, Belgium, Bosnia-Herzegovina, Bulgaria, Croatia, Czech Republic, Denmark, Estonia , Finland, France, Malta, Moldova, Monaco, Montenegro, Germany, Greece, Hungary, Iceland, Italy, Kosovo, Latvia, Liechtenstein, Lithuania, Luxembourg, the Netherlands, Norway, Poland, Portugal (including Azores Islands), Republic of Ireland, Republic of Macedonia, Romania, San Marino, Serbia, Andorra, Austria, Belgium, Denmark, Finland, France, Malta, Monaco, Germany, Greece, Iceland, Italy, San Marino, Liechtenstein, Luxembourg, The Netherlands, Norway, Portugal, Slovakia, Slovenia, Spain, Sweden, Switzerland, Turkey, Ukraine, United Kingdom, Vatican City. Current speed - Speed limit - Speed camera alerts (subscription is required for updates) - Street name - Arrival time - Driver alerts including sharp curves - Fatigue warnings - Speed changes - Wrong way on a one-way and railroad crossings - Lane assist - Junction view - Up ahead and Foursquare points of interest - Route preview. Upgrades up to 4 times a year - Free. Faster time - Off road - Shorter distance - Easy route shaping - Up Ahead Points of Interest Route Planning with Trip Advisor ratings. PhotoReal Junction View - BirdsEye Junction View - Active Lane Guidance. Hands-free calling - Smart notifications - Voice-activated navigation - Live parking and weather via the Smartphone Link app. Access free Garmin Live Services for real-time information - Live Traffic - Live Parking - Live Track - Weather - Last Mile - Foursquare - Address Sharing. Rechargeable Lithium-ion battery - Vehicle power cable. The item "Garmin DriveAssist 51LMT-D with Built-in Dash Cam, Lifetime Full Europe Maps" is in sale since Wednesday, March 27, 2019. This item is in the category "Vehicle Parts & Accessories\In-Car Technology, GPS & Security\GPS & Sat Nav Devices\Portable GPS Systems". The seller is "musictunes08" and is located in London, London. This item can be shipped worldwide.